To put his English fluency into practice, Julio Cezar Santos decided to travel abroad for the first time and went on an exchange program to Ireland, a country that fascinates him. 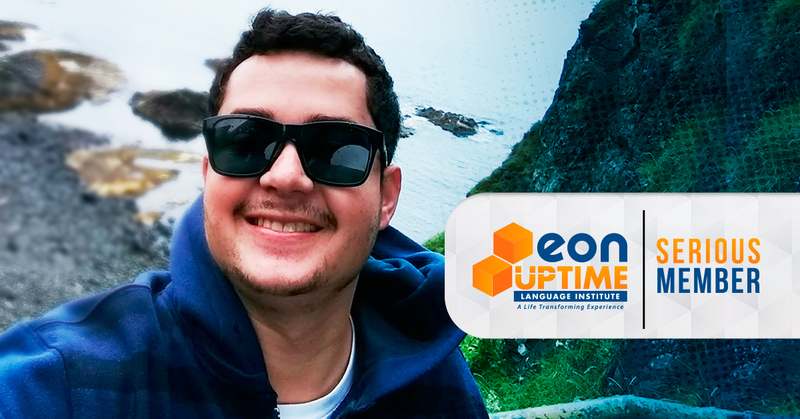 When he decided to start studying at EON UPTIME, Julio Cezar Santos, who is a systems analyst, had the dream of traveling to different countries. What he didn’t know was that in a short time, about one year, he would become fluent through EON UPTIME Lavras (MG) and go on an Exchange program to Ireland. He would also visit the city of light, Paris, in France, where a friend of his lives. He shares his memories from this unforgettable trip and the importance of fluency in English for his experience. Julio Cezar heard of EON UPTIME through a friend, who was aware of his desire to study English and recommended the course. “I have always liked the English language and I saw the opportunity to become fluent in a short period of time at EON UPTIME”, he remembers. After concluding the Connected course, Julio Cezar thought it was time to put into practice what he had planned: visit other countries. For that, he counted with the support of Egali, UPTIME International’s partner. “Egali has provided support in all the stages of the exchange program. They were always considerate when answering my questions; I would definitely go on another trip with them!” he reports. In July 2017, the systems analyst debuted in a series of experiences such as traveling by plane, visiting a new country and practicing the English language with native speakers. With the fluency acquired at EON UPTIME, where he learned English from scratch, Julio Cezar traveled confident for his 21-day trip to Ireland. He reports that he passed through an adaptation period in the first few days, due to the variety of accents of the tourists who visited the island – “But soon I was communicating easily, without many problems”, he remembers. He keeps a “photo-diary” from the trip, with pictures of all the tourist attractions he visited, such as The Dark Hedges (which was a shooting location for the series Game of Thrones), Guiness Storehouse and the castles Dunluce and Dundrum. Since he came back from his trip, Julio Cezar has never stopped improving his fluency, especially because of his professional area, in which he uses his reading and writing skills on a daily basis. “I often have to research information to solve doubts or learn new things, and it’s always easier to find it in English. That’s why I my standard is to do this in English”, he says. Currently, his biggest plan regarding the language is to visit other places around the world: “And the English language will definitely help me with these plans”, he affirms. Check out Herbert Schnaider’s story, who at the age of 63 became fluent through EON UPTIME and went on an exchange program to Ireland with Egali.